This project aims to enhance the dissemination and promotion of evidence-based strategies and resources to support the prevention and control of heart disease, stroke, and related risk factors such as high blood pressure, high LDL cholesterol, and high sodium intake. The National Human Genome Research Institute is soliciting grant applications for the support of CEERs. The program is designed to support the establishment of sustainable trans-disciplinary research teams with the expertise and flexibility to anticipate, conduct research on, and quickly address a range of cutting-edge ethical, legal, and social issues related to genetics and genomics. The goal of the NN/LM is to advance the progress of medicine and improve public health by providing U.S. health professionals with equal access to biomedical information and improving individual's access to information to enable them to make informed decisions about their health. The Neuroscience Blueprint is supporting a Lifespan Human Connectome Project to extend the Human Connectome Project (HCP) to map connectivity in the developing, adult, and aging human brain. The goal of this FOA is to solicit grant applications that propose to extend the experimental protocols developed through the HCP to children in the 0-5 year old age range to investigate the structural and functional changes that occur in the brain during typical development. Northwestern University Feinberg School of Medicine created a $200,000 prize in medical science. The first of which will be awarded in 2016 and will go to a physician-scientist whose body of research exhibits outstanding achievement in their disciplines as demonstrated by works of lasting significance. The purpose of this FOA is to promote the development of an interdisciplinary workforce for conducting bioinformatics research in diabetes, obesity, and related metabolic diseases that are relevant to the research mission of NIDDK. This FOA encourages the submission of pilot and feasibility trials conducted in humans that will lay the foundation for larger clinical trials related to the prevention and/or treatment of diabetes or selected endocrine and genetic metabolic diseases within the mission of the NIDDK. The purpose of the program is to increase and maintain a strong cohort of new and talented, NIH-supported, independent investigators conducting minority health and health disparities research. Baxter’s annual award program is open to graduate students and postdoctoral fellows. These awards seek to stimulate and reward research applicable to the development of therapies and medical products that save and sustain patients' lives. This program supports early postdoctoral research training in all basic biomedical sciences. To attain its ultimate goal of increasing the number of imaginative, well-trained and dedicated medical scientists, the foundation grants financial support of sufficient duration to help further the careers of young men and women engaged in both biological or medical research. This FOA invites grant applications from institutions that propose to develop clinician-scientists who will be leaders in the field of pediatric clinical pharmacology research. The 2016-2018 cohort offers an opportunity for nurses and physicians to collaborate on leadership and research skills. UCLA, University of Michigan, University of Pennsylvania, and Yale University have formed the consortium that sponsors the program, which is open to people with MDs or RN degrees with a doctoral component. On loan from Vanderbilt University, the ResearchMatch kiosk can be found in the waiting area between Emory Clinic A and B. As an organization which aims to expedite the translation of healthcare discoveries to patients, Emory Healthcare is pleased to offer ResearchMatch.org – a not-for-profit website that brings together researchers and people who are willing to learn more about research studies on a secure and convenient website. Visit the kiosk today or register online! Presented by Johannes Reynisson, PhD, University of Auckland in Georgia Tech’s MoSE Building, Room 3201A at 4:00 p.m.
Roberd M. Bostick, MD, MPH, Professor, Emory RSPH, Department of Epidemiology and Emory SOM, Department of Hematology & Medical Oncology, Winship Cancer Institute, will present this seminar sponsored by the Emory Center for Clinical and Molecular Nutrition, HERCULES, and the GDBBS graduate program in Nutrition and Health Sciences. Academic investigators can find out how to collaborate with small businesses through the SBIR/STRR programs at NCATS; the National Heart, Lung and Blood Institute; and the National Institute of Neurological Disorders and Stroke. Experts will share unique pre-clinical and other resources to enable Investigational New Drug applications to the Food and Drug Administration. This ACTSI-supported work is presented by Karen Bearss, PhD, Assistant Professor Department of Pediatrics Emory University School of Medicine. Presented by the ACTSI’s Community Engagement Research Program (CERP) this forum will help build successful academic and community partnerships to achieve health equity. REGISTER NOW! The Atlanta Business Chronicle recently featured 20 clinical trials across the state of Georgia that have the potential to make a big difference in health care. 16 out of the 20 trials identified are led by ACTSI-partner institutions and 5 out of 20 are conducted in an ACTSI Clinical Research Network (CRN) or Pediatrics Clinical Research Site. 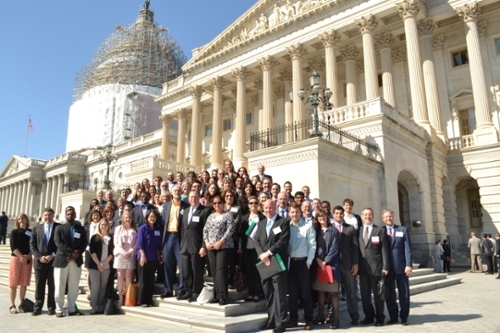 On April 16, nearly 125 grassroots advocates, including Andrew West, MBA, MPH, Sr. Center Administrator, ACTSI; Rakale Quarells, PhD, Associate Professor, Morehouse School of Medicine; and Jennifer Felger, PhD, Assistant Professor, Emory University, participated in the clinical and translational research community’s 2015 Capitol Hill Advocacy Day. The primary goal of these advocates was to educate policymakers about the value and importance of federal clinical and translational research programs.